Years ago, I bought a piece of paper that has a pattern of broken sheet music. I bought it because I was a “band geek” from elementary school through high school, and nostalgia kicked in. I hadn’t thought of a use for it, though, until recently. I remembered a bird stamp I’ve had for a couple of years, and something clicked. I suppose the lesson here is that those old pieces of patterned paper that have gone unused may one day become a part of someth ing great — you just have to wait until the right ingredient comes along. Or until you remember that you have a stamp that would be perfect for it. 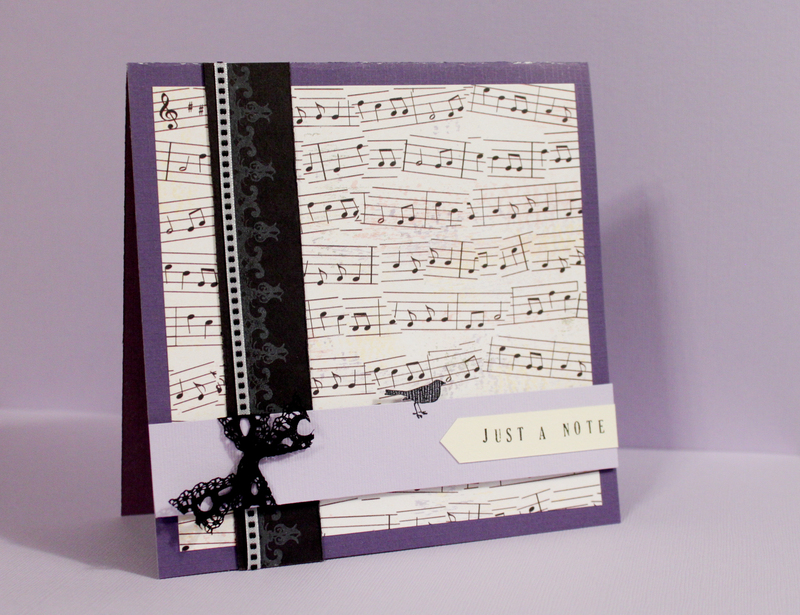 This card features some distressed edges. I have a distressing tool, but until I had that, I moved the paper back and forth between two tines of a fork. I also cut out part of the stamped image to give some dimension. Detail scissors are key for this. There are two benefits from this card: I used a paper I’d thought I’d never use, and I have a card for future use. The latter is good for me, because I typically create cards as I need them. It’s good to have some “emergency” cards on hand.